New research by Professor Christopher J. Ferguson of Texas A&M University concludes that there is "no significant relationship" between violent videogames and school shootings, and strongly criticizes "faulty" claims that such a relationship exists. Ferguson's report, The School Shooting/Violent Videogame Link: Causal Relationship or Moral Panic?, begins with a short overview of current research on the impact of violent videogames on behavior, saying that the results of such studies are "mixed," with some supporting a link between violent gaming and aggressive behavior and others finding no such link. But results are tainted by numerous factors, he says, including the failure to include "third" variables such as personality, family violence and genetics, as well as the "considerable difficulty in generalizing the results from laboratory tests of aggression to real world serious acts of aggression." Lacking a solid body of facts, Ferguson said videogame opponents rely instead on the creation of "moral panic" to popularize their views. "A moral panic occurs when a segment of society believes that the behavior or moral choices of others within that society poses a significant risk to the society as a whole," he explained. "Moral panics may emerge from 'culture wars' occurring in a society, although moral beliefs often become disguised as scientific 'research,' oftentimes of poor quality." Real causes of violent crime, like family environment and poverty, are difficult problems to address, he said, while videogames present a "straw man" that politicians can use to create the appearance of taking action. The media also has a hand in promoting such panics, indulging the public appetite for sensationalism regardless of the actual facts at hand. Even scientists can be prone to using moral panics to forward their agendas, according to Ferguson. "It has been observed that a small group of researchers have been most vocal in promoting the anti-game message, oftentimes ignoring research from other researchers, or failing to disclose problems with their own research," he wrote. "As some researchers have staked their professional reputation on anti-game activism, it may be difficult for those researchers to maintain scientific objectivity regarding the subject of their study." 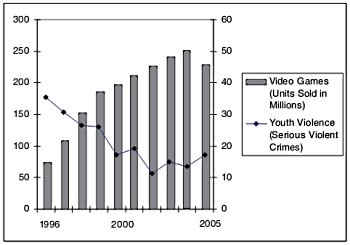 Ferguson notes the fact that police arrest and crime victimization data have shown that while violent videogames have become more prevalent in society, violent crime has decreased dramatically, not just in the U.S. but in Canada, Australia, the E.U. and U.K. as well. "For our understanding of [school shootings] to progress, we must move past the moral panic on videogames and other media and take a hard look at the real causes of serious aggression and violence," he wrote. "As presented here, the wealth of evidence, from social science research on videogames, to governmental reports and legal cases, to real world data on crime, fails to establish a link between violent videogames and violent crime, including school shootings. The link has not merely been unproven; I argue that the wealth of available data simply weighs against any causal relationship."